UA Local 74 was established in October 1988 in Wilmington, Delaware. Originally two separate locals in our territory performed work for our contractors in our jurisdiction.They were Pipefitters Local 80 and Plumbers Local 26. These two locals were merged by our international union (UA) in 1988 to become Plumbers and Pipefitters Local Union 74. Steamfitters Local 80 was established on September 9, 1944. In 1956 the name was changed to Pipefitters Local 80. Plumbers Local 26 was established on March 10, 1900. 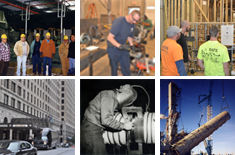 Since the merger, Local 74 has provided a quality work force to our customers to build and maintain the mechanical systems necessary to run their facilities.